Even though they’re not chocolate, Mexican Wedding Cookies are one of my favorites. 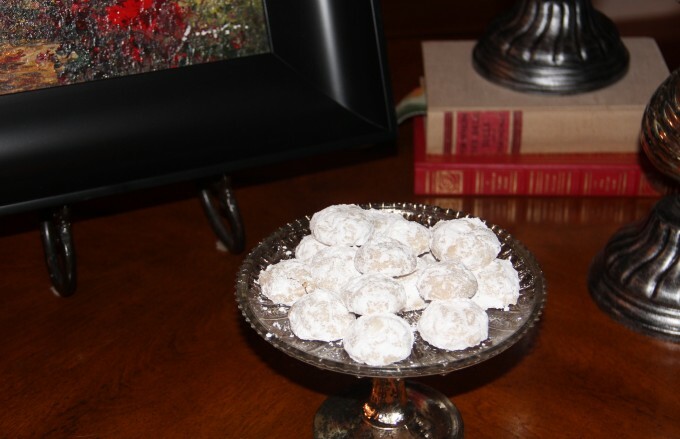 I love the buttery, soft texture with just a little crunch from the ground nuts and the flavor is so divine…not too sweet even though they are rolled in powdered sugar. I usually make a few dozen of these cookies for Christmas, but we enjoy them throughout the year as well. And they are super easy to make. You can even keep some of the dough in the freezer and have a few whenever you get a hankering. 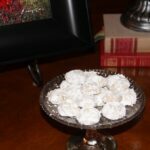 There are a bazillion recipes for Mexican Wedding Cookies, some using almonds, some walnuts and some pecans. I prefer pecans, maybe because they are a significant crop in Georgia and I like to support the local economy. 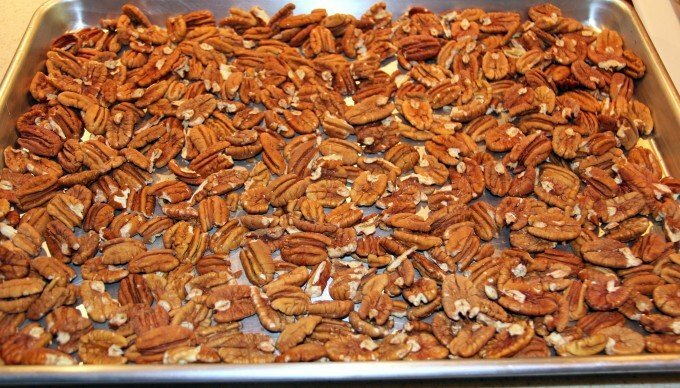 I always start by roasting the pecans to bring depth to the flavor of the cookies. Just spread pecan halves on an ungreased cookie sheet and roast at 350° for 8-10 minutes. After roasting, grind the nuts in a food processor and then add 1/2 cup flour. Pulse a couple of times to mix. In a large mixing bowl or stand mixer, mix butter, vanilla and powdered sugar. Add flour and then the nuts. The dough will come together in the mixer and will be stiff. Scrape out all the dough onto a piece of plastic wrap, cover and place in the refrigerator to chill for at least half an hour. 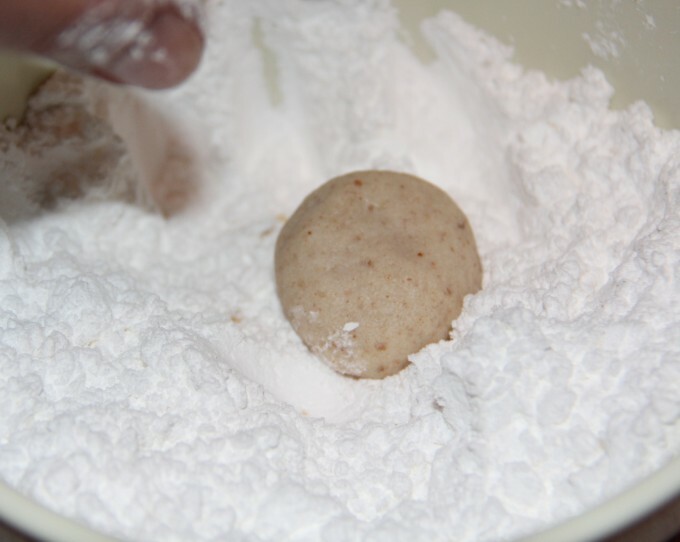 When ready to bake, scoop out about a tablespoon of dough and roll into a ball. Place on cookie sheet lined with parchment or Silpat. These cookies don’t spread much so you can place them pretty close together. Bake at 325º for 17-19 minutes, until the tops of the cookies are slightly golden and the bottoms are just beginning to brown. Cool cookies on cookie sheets for a couple of minutes, then transfer to wire racks and cool completely. This is important, because if you try to roll them in the sugar while they are still warm, the cookies will crumble. 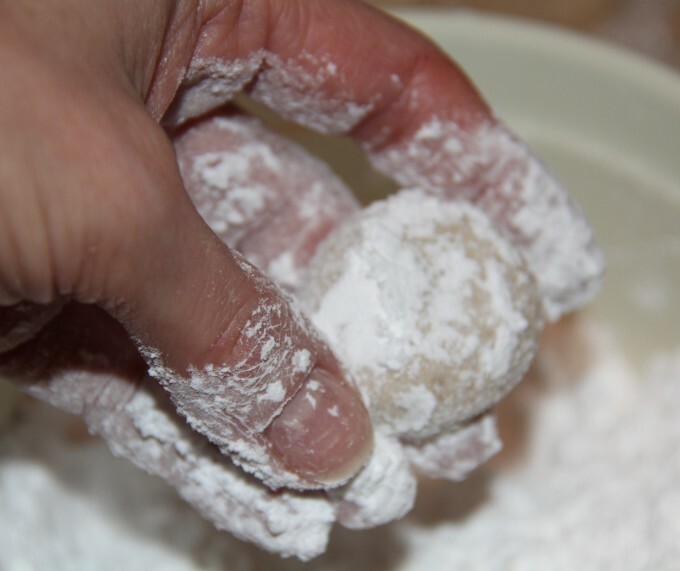 Place about a cup of powdered sugar in a bowl, and one at a time, gently roll each cookie in the sugar. Place the cookies back on a serving platter or in a sealed container. These cookies will keep for a few days, but I think they are best eaten within a day or two. Of course, that’s not a problem around my house because they disappear within a few hours. A buttery cookie that is not too sweet and delicate enough for bridal or baby showers or just Tuesday afternoon. In food processor, grind pecans and measure out 1 cup. Place the 1 cup pecans back in food processor and add 1/2 cup flour. Pulse until mixed. In stand mixer, mix butter, vanilla and 1/2 cup powdered sugar. Add the remaining 1 1/2 cups flour. Add the nuts. Mix on medium until the dough is well blended and stiff. 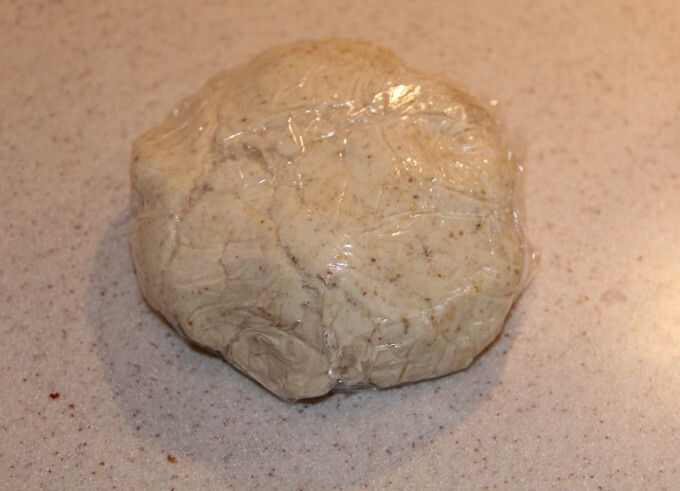 Scrape dough onto a piece of plastic wrap and cover completely. Chill for at least 30 minutes. Can be made ahead to this point and refrigerated for several days or placed in freezer. 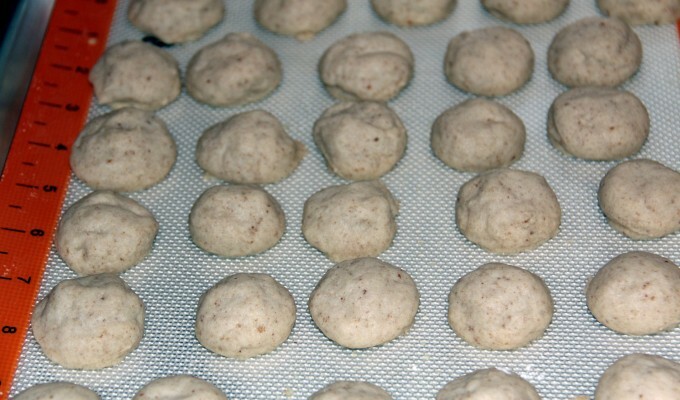 When ready to bake, scoop off tablespoons of dough and roll into balls. 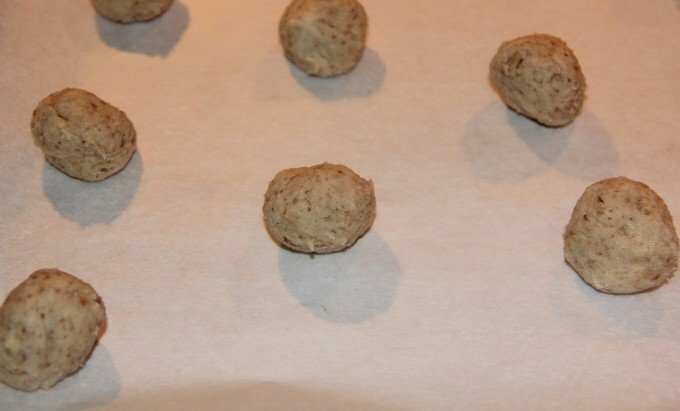 Place balls about an inch apart on cookie sheet lined with parchment or Silpat. Bake at 325 for 17-19 minutes, until tops are golden and bottoms just starting to brown. Cool on cookie sheet for 2 minutes. Transfer to wire rack and cool completely. Place remaining 1 cup powdered sugar in a small bowl. 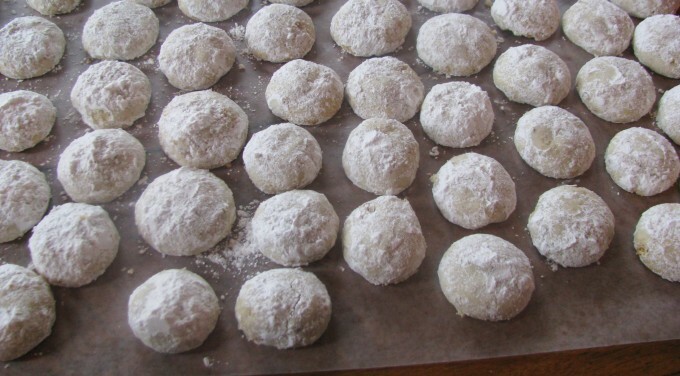 Gently roll each cookie in the powdered sugar until covered. It’s hard to say since they rarely turn out the same size but around 4 dozen is a good estimate.